When I’m trying to eat healthy, I end up eating A LOT of chicken. Sure, it’s good for you… high in protein, low in fat, blah, blah, blah. But let’s face it… boneless chicken breasts can be pretty boring. And for all they boast in health benefits, they can sometimes lack in flavor. Not to worry though, I have an easy fix for this. Simply stuff ‘em! You can pretty much choose whatever ingredients you want. 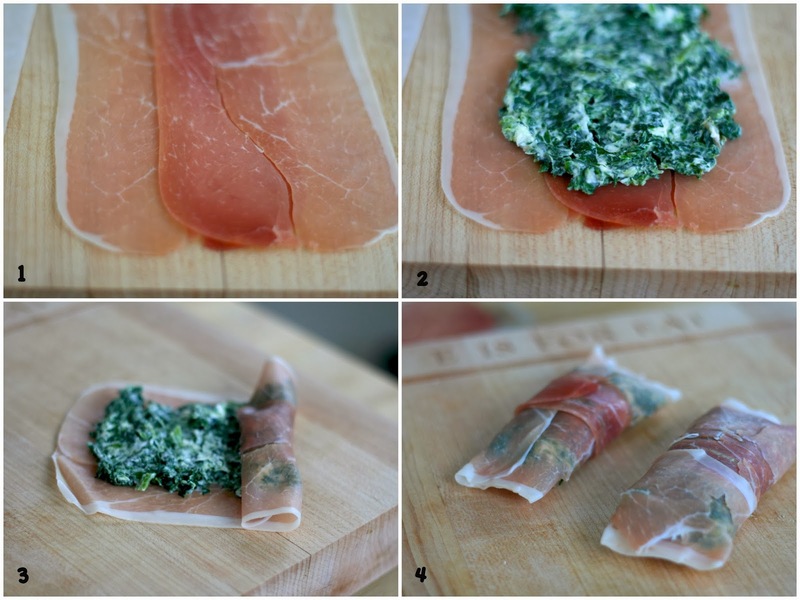 I’ve done goat cheese & pecans in the past… but this time I decided to do prosciutto, spinach and goat cheese for my filling. Yes, I realize prosciutto and goat cheese aren’t the healthiest of options, but we’re only talking a small amount here. So as long as you don’t eat extra slices of prosciutto as you’re cooking you should be fine (I may or may not have done this…don’t judge). Mix together some cooked spinach (about a cup if you’re making 4 chicken breasts) and about a half cup of goat cheese crumbles, or about 2 ounces. (See? That's only two tablespoons per breast. Hardly any cheese at all). I prefer to sauté fresh spinach, but I give you permission to use some frozen stuff to save time and money. Low fat ricotta cheese would also be a good alternative here. 1.) Lay out prosciutto on a cutting board. If your slices are super thin, you might want to double up or overlap. 2.) Spread about 1/4 of the spinach mixture on each piece and 3.) roll 'em up! Resist the urge to pack them super full or they will be hard to stuff into the chicken. 4.) Press the edges of the prosciutto together. You should have 4 little "packets" of goodness! Heat 3 tablespoons of olive oil in a large saute pan. 1.) Dredge each bundle in flour, and 2.) fry, 3.) turning every five minutes or so, until completely cooked through, about 15-20 minutes. Remove to a plate and tent with foil until you're ready to serve. 4.) The sauce is sort of optional, but I think it's a nice addition. I added some shallots and garlic, a little chicken broth, white wine and chives. Mushrooms might be a good addition as well. Remove twine and using a very sharp knife, slice the chicken and plate. Drizzle sauce over the top, if using. 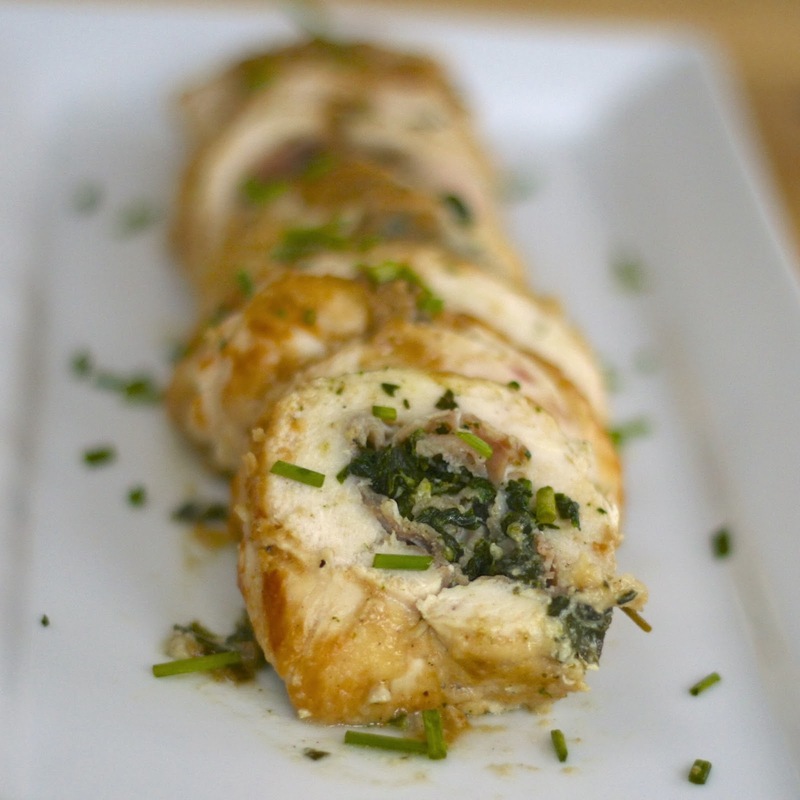 Sprinkle with additional chives and serve! 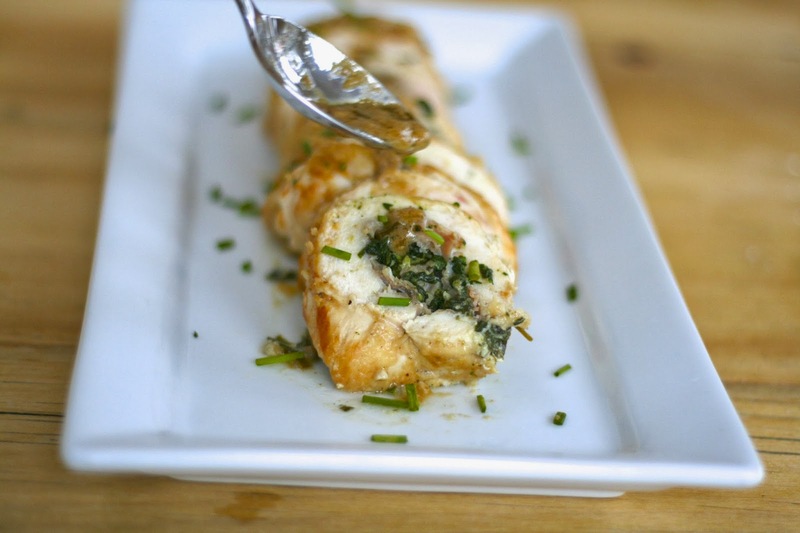 If you are using 6-ounce chicken breasts, and keep it to one slice of prosciutto per chicken breast, each piece will equal out to about 395 calories, and that's IF you use the sauce. Not bad! Carefully butterfly each breast without cutting all the way through and open so they lay flat. Using a chicken pounder, gently pound into thin, even pieces, about 1/4 inch thickness or thinner if possible. Season inside with salt and pepper. 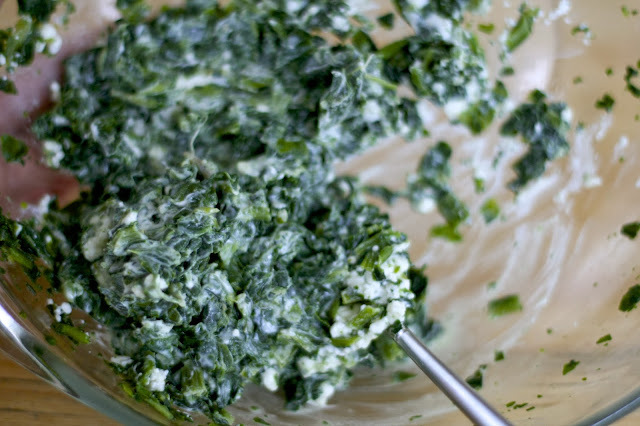 Mix together cooked spinach and goat cheese crumbles. Season with salt and pepper. Lay out prosciutto on a cutting board. Spread about 1/4 of the spinach mixture on each piece and roll into packets. Press the edges of the prosciutto together. 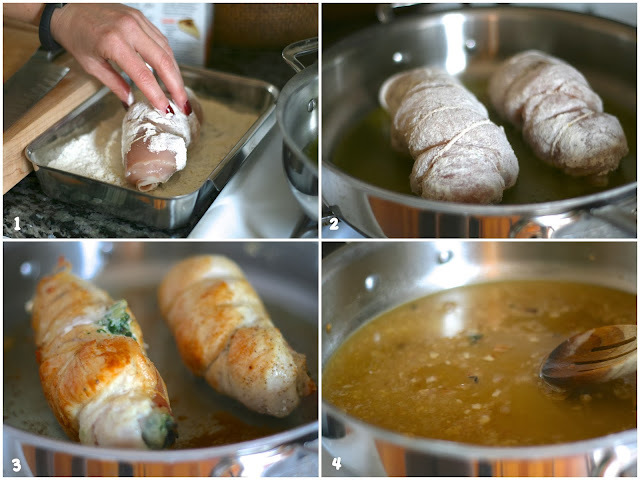 Place a prosciutto packet on top of pounded chicken. Roll and secure with twine. Heat 3 tablespoons of olive oil in a large saute pan over medium-high. Dredge each chicken bundle in flour, and fry, turning every five minutes or so, until completely cooked through, about 15-20 minutes. Remove to a plate and tent with foil until you're ready to serve. To serve, remove twine from chicken and then using a very sharp knife, slice the chicken at a slight angle and plate. Drizzle sauce over the top, if using. Sprinkle with additional chives and serve! To make a sauce to go with the chicken, saute shallots and garlic for about a minute over medium heat in same pan used to cook chicken. Deglaze the pan with chicken broth and wine, scraping up brown bits with a wooden spoon. Stir in lemon juice, Dijon and chives, and cook until reduced and slightly thickened, about five minutes.